← November 15, 2013 Al and Gray’s Mixed Bag! For the last three years, I’ve donated a full day charter to the Washington State Tuna Classic Albacore Tournament. Each year they donate thousands of pounds of albacore to the Northwest Harvest food bank and provide fishing opportunities for soldiers wounded in combat. Last years raffle winner was Josh! He and his son Grady placed in the top 20 last year and would have done better if they didn’t plug their boat with albacore early in the day! After a hard days worth of fishing, Josh and his family went to the tournament party like all the others hoping to win some prizes at the raffle. They really wanted to win my charter an unfortunately for them, my charter was the last raffle to be presented and it was nearing 11pm. Josh’s wife has always wanted to go to Hawaii and Josh was hoping this would be their “excuse” to make the trip. Before the winning number was announced Josh leaned over to his son and said, “if we win this, we’re going to Kona!”. His number was up and he was on his way to Kona! Originally, we had planned to fish a few days earlier but the weather was unseasonably rough so we rescheduled to another day. Josh and Grady met me earlier the next day and we headed offshore at first light. He’d never caught a big ahi so that’s what we targeted today. We ran far in hopes of finding porpoise. Eventually we found them and even though the school was small we gave them a try. We put our baits out and on our second pass a nice ahi exploded on one of our baits! 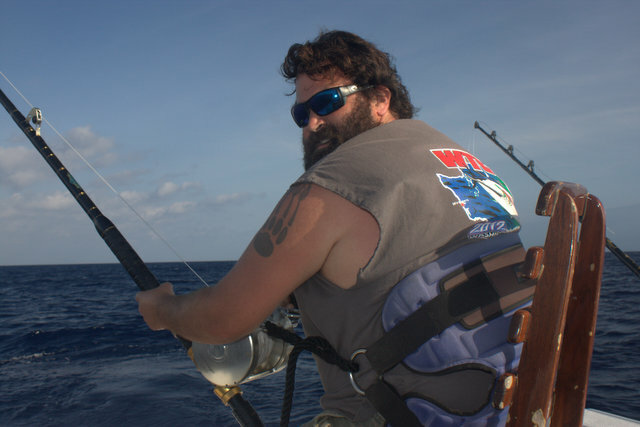 Josh got harnessed into the fighting chair and fought his first ahi weighing 130lbs in about 15 minutes! The wind started to blow out of the north pretty hard and white caps were starting to form. This is really odd for Kona and we are used to fishing in almost dead flat calm water 99% of the time. It took us a while to find the pod of porpoise. Once we did, we reset our baits and continued to work the school. I wasn’t marking many fish in the school, maybe 2 at the most so I was weighing our options for the rest of the day. 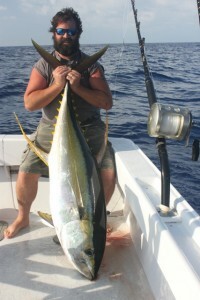 Unexpectedly, another nice ahi took one of our baits! This one was a little bigger and smoked the Fin Nor 130! Josh again got geared up and fought our second ahi to the boat in about 20 minutes! It would hit the scales at 148lbs! By now, I was afraid we would have lost the school for good but we again scoured the ocean to find them and we did! I marked one more fish in the school on every third or fourth pass. It wasn’t looking good. As we were about to give up, another big pod of porpoise joined the pod we were with and with them were a few more fish! I had a nice mark on my sounder and as we both looked back at our baits a monster explosion erupted just a few yards behind the boat! Josh buckled into the chair and got to work. The fish made some weird runs and at times we thought it had come off. In about 20 minutes Josh would land our biggest ahi of the day! As I slid the fish into the boat I guessed 190lbs but when I tried to get it into the fish box I re-estimated at 200lbs! We don’t see too many ahi over 200lbs in Kona so anything over that is a real trophy! 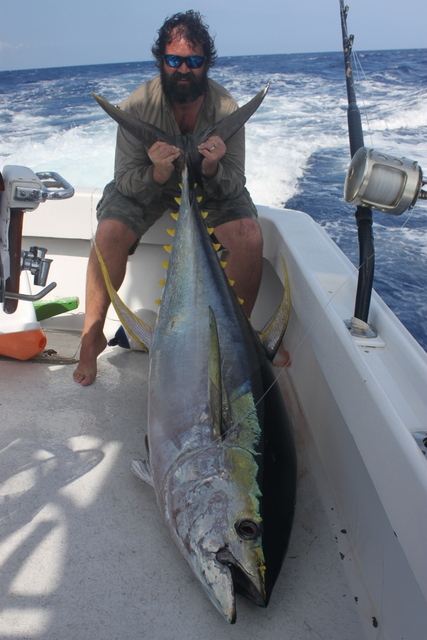 At the scales, Josh’s ahi would end up at 225lbs! Luck struck twice! Winning the raffle and landing a 200+lb ahi! 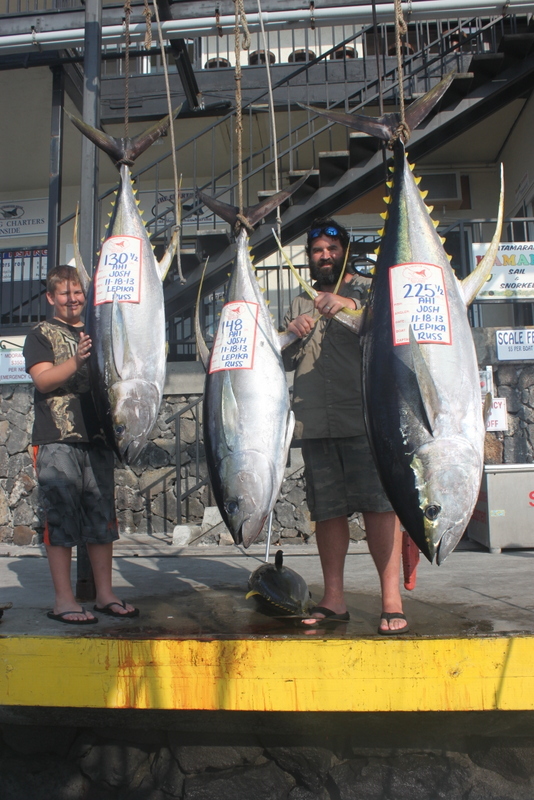 We would end the day catching our fourth ahi weighing just over 80lbs! For sure Josh is a lucky guy to not only win the raffle but to catch an ahi of a lifetime! Hopefully, his luck will continue and maybe we’ll see him next year!